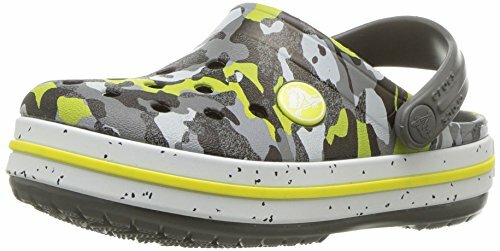 Give his look a little something extra with the comfy and casual Crocs® Kids Crocband Camo Speck Clog! Thermoplastic (EVA) material construction for maximum lightweight cushioning. Heel strap provides a secure fit every time. Footbed conforms to the heel while circulation nubs stimulate blood flow. Sporty midsole band offers a bold touch of classic appeal. Non-marking outsole delivers traction on a variety of surfaces. Imported. Measurements: Weight: 3 oz Product measurements were taken using size 9 Toddler, width M. Please note that measurements may vary by size.